In some documents, you may use many acronyms (i.e. words formed from the initial letters of multi-word names, e.g. VBA for "Visual Basic for Applications"). It is helpful to include the definition/full name the first time you mention an acronym. Alternatively, you may want to create a list of all the acronyms and include the definitions in the list. Here you will find both a macro and a free Word add-in that lets you extract all the acronyms of a document to a table in a new document. The table has room for the definitions and also shows the page number of the first page where each acronym is used. The acronyms will be sorted alphabetically. In addition, you will find information about a third-party add-in that lets you manage acronyms incl. definitions. 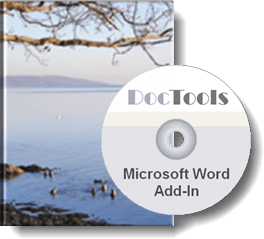 The functionality for extracting acronyms included in the DocTools ExtractData add-in finds and extracts acronyms consisting of 3 or more letters. It does not extract any definitions. If you are working with large documents with many abbreviations and acronyms you should have a look at the Acronyms Master add-in. I was actually working on an advanced add-in for extracting acronyms including their definitions when I found Acronyms Master developed by Alexander Becker. After having tested Acronyms Master I decided to refer to that add-in instead - it is easy to use, affordable and includes all the functionality you need. You can try out Acronyms Master for free.